What do people do when outlasting the frequent rains of the Pacific Northwest? They chew a gum. What do they do with the gum once they are finished chewing it? They stick it to a wall. Well, this certainly beats spitting the gums on the ground, where innocent tourists step on them. It definitely is somewhat disgusting. But it’s also cult. The Seattle Gum Wall, below the famous Pike Place Market. If you want to see more, continue after the jump. Viewer discretion is advised 😉 …. 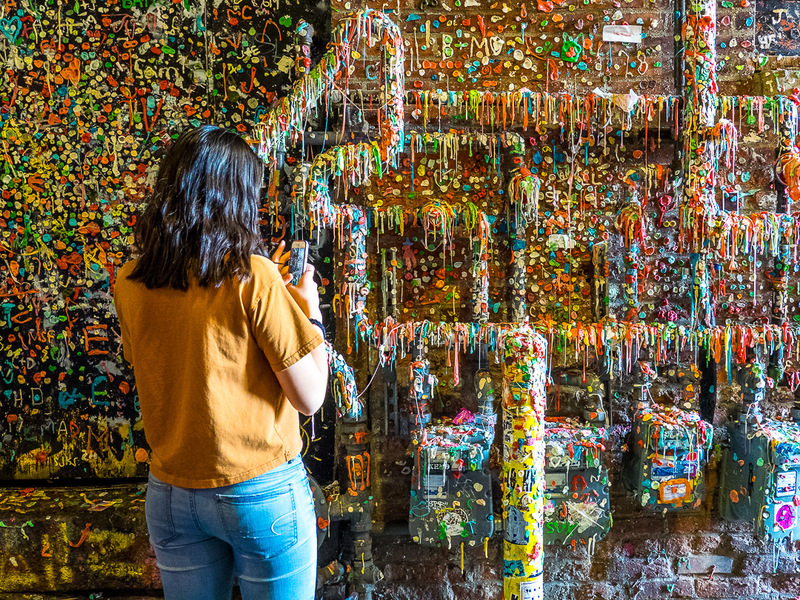 The Market Theater Gum Wall in Post Alley underneath the Pike Place Market in downtown Seattle feature brick walls covered in used chewing gum. The tradition was initiated in the early 90’s when patrons of the theatre stuck chewed gum to the wall and placed coins in the gum blobs. 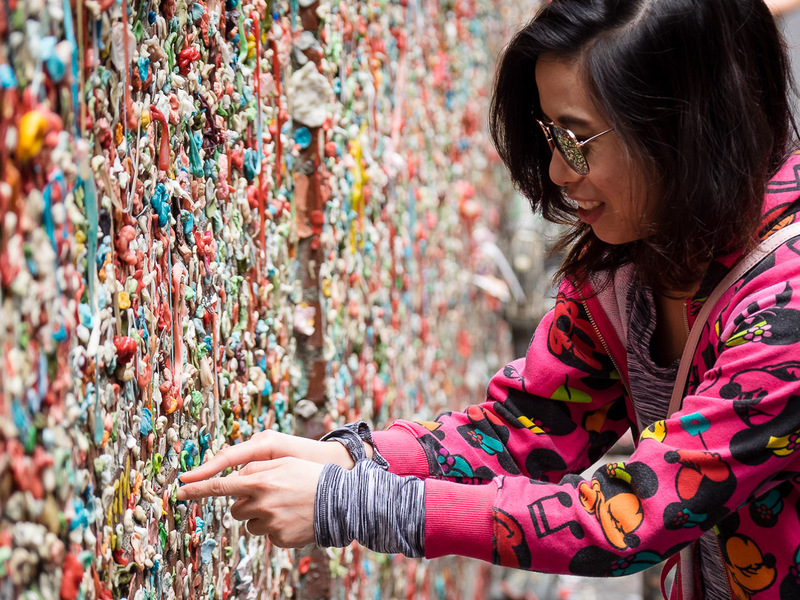 Theater workers scraped the gum away twice, but eventually gave up, after the gum became a tourist attraction around the change of the millennium. 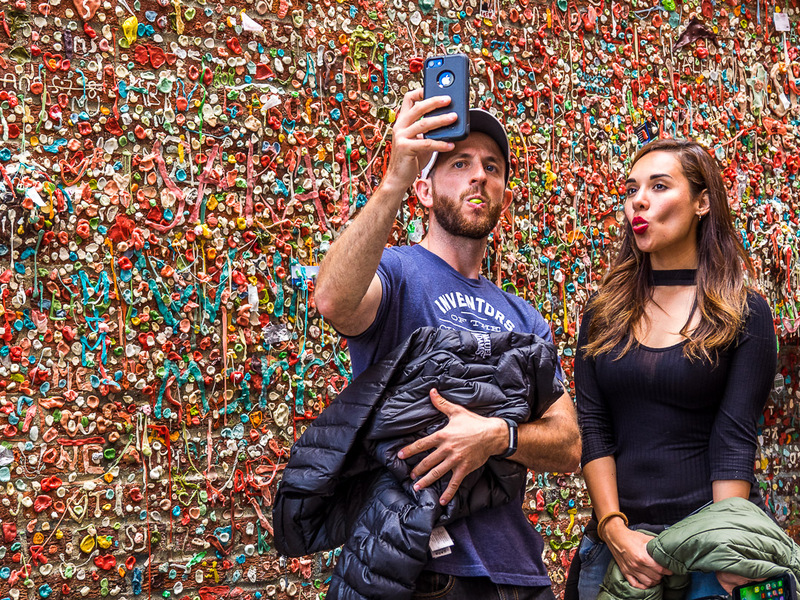 Today, chewing tourists pose in front of the wall before sticking their own gum to the bricks, often formed into creative pieces of art. But it is certainly a very germinating attraction of the Emerald City. All photos were taken with the Olympus OM-D E-M1 with the mZuiko 12-100 mm F/4. For tips and inspirations around photography in general check out my free Learning Center. It’s strangely fascinating, but grotesque at the same time. Very colorful though. lol. I really like the composition of the shots that you chose. How interesting! 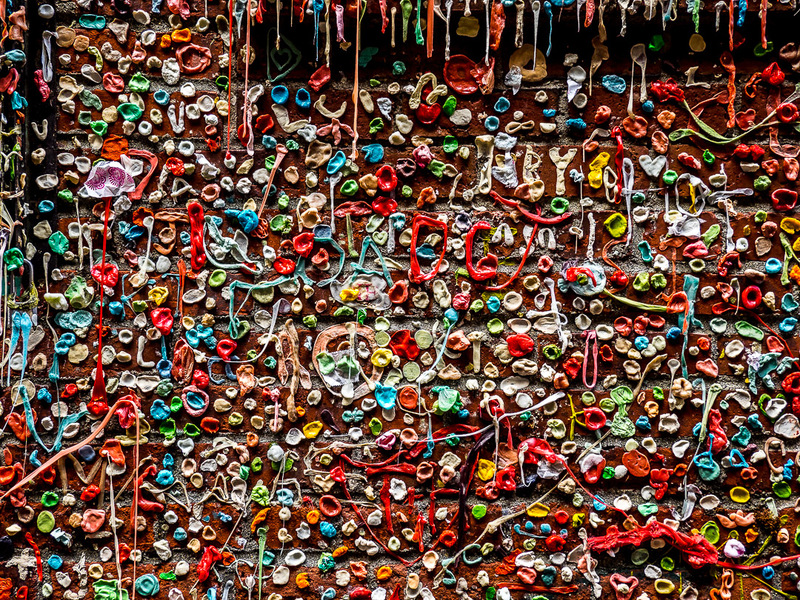 This is the first time I have been reading about a chewing gum wall! How very peculiar! Very colourful, if not a little bit acky!!!!! If I lived in Seattle I wouldn’t be adding to that wall any time soon. Gosh, what will they think of next! Very bright and colourful though! Thanks, Marion. Those kind of places you can only find in the US. It is kind of gross walking through it…. The most interesting “stalagmites” I’ve seen yet. I have seen that wall in Seattle, a piece of art, but quite gross. Fascinating and I agree, a bit disgusting. Neat and gross 😛 Awesome photos! !